The Black-footed Ferret (Mustela nigripes) was considered extinct until it was rediscovered in 1981 in Meeteetse, Wyoming. Shortly after that a captive breeding program was started, and in 1991 captive-bred ferrets were released into the wild. They are still classified as an endangered species today, and breeding and conservation programs continue. Because the Black-footed Ferret relies primarily on prairie dogs as its food source, it lives in and around prairie dog communities. Originally, the prairie dog ecosystem occupied 20 percent of the entire western rangeland, allowing ferrets to cover a large geographic area. 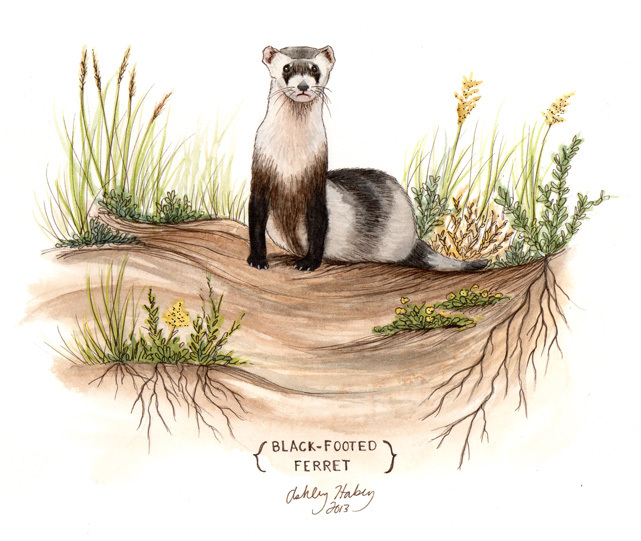 Today that area is limited and Black-footed Ferrets are found only at reintroduction sites. Much more information, photos and video are available on the Black-footed Ferret Recovery Program website.